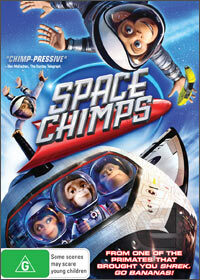 Loosely based on the manmade experiments to send chimpanzees to space, Space Chimps is the latest computer animated film from Roadshow which is directed by De Micco and is about a group of "chimps" who are once again sent into deep space. The story behind Space Chimps involves an alien orb that was sent by man into a wormhole and ends up on the other side of the galaxy where a tyrant named voiced by Jeff Daniels gets his clutches on this strange device and wishes to investigate its origin. Assembling a simian team that include Patrick Warburton as the commander of the team, scientist Luna (Cheryl Hines) and a loose canon named Ham III (Andy Samberg) whose father was a circus chimp, however his grandfather was part of the space program. All three are thrown into the unknown in this entertaining movie which contains action, drama, adventure, romance and of course comedy. The best part of Space Chimps is the witty script by Kirk De Micco and Robert Moreland who really put quite an effort into the story and the great one-liners which target a variety of ages. Of course, besides the entertaining story, the star of the movie are the CGI which simply look phenomenal with exceptional video and audio quality. It's definitely a great cinematic experience and unfortunately Space Chimps wasn't the box office success that the creators were counting on. Needless to say, this is one movie that kids of just about all ages will thoroughly enjoy!